Ibanez takes it up another notch with Artstar Prestige, a new line of exquisite made-in-Japan instruments. For the first time ever, Ibanez brings the crown jewel of Prestige production to its Artstar hollowbody concept, making its credo: Hollowbodies of The Highest Order, a mission statement made manifest through the excellence of Artstar Prestige design and luthiery. Those whove followed Ibanez jazz guitars through the decades may see Artstar Prestige as the completion of a circle. The guitar maker for numerous names on Downbeats Readers pollsmaster players like George Benson and Pat Metheny are a testament to the preeminence of made-in-Japan Ibanez jazz guitars. Artcore, Expressionist, and Artstar offer up-and-comers inspiring instruments that won't break the bank. Now, Artstar Prestige offers custom-built, made-in-Japan quality for the serious professional. 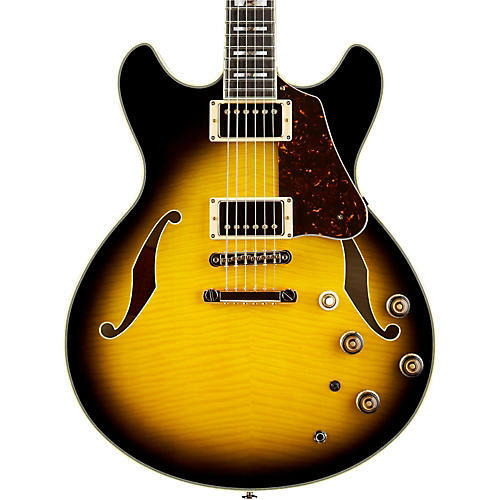 With its Vintage Yellow Sunburst finish and Flamed Maple top, back, and sides, a deep love of semi-hollow guitar history emanates from the AS200. The luthiers skill becomes immediately apparent upon playing your first chord progression on its bound ebony fingerboard, inlaid with Pearl/Abalone blocks. Medium frets with meticulously hand-filed edges are buttery smooth to your chording hand. The set-in neck is immaculately joined to the body, and its Gotoh 510BN bridge is the perfect blend of traditional style and technological integrity. At the headstock end of the fingerboard is a clean, perfectly set bone nut. Rounding out this stunningly crafted piece is the famous Ibanez Super 58 pickup, known for its balanced tone character and sonic fullness, whether restrained to jazz-clean or cranked up to gritty rockin blues. Tri-Sound switching, borrowed from the legendary Ibanez Artist, provide the AS200VYS with endless tonal flexibility. Hardshell case is included.